At the end of Saw Mill road, off Tyngsboro Road, there is a trail leading into some Town owned land. Lenny Palmer of the Conservation Trust told me about it when we were planting the Christmas tree by the Abbott school last week. On Tuesday, Lad and I went in to see it and have a walk. 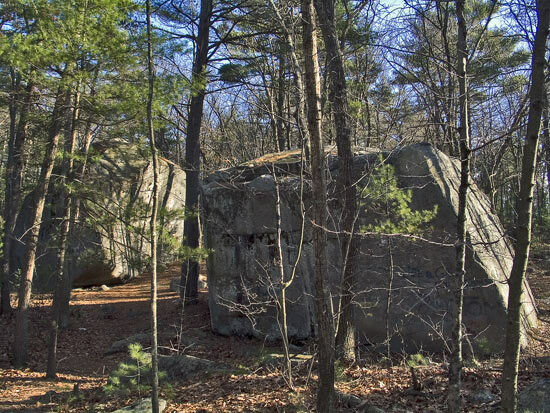 These two granite boulders, as their names imply, are about the size of a house and barn. In fact there are several sets of boulders in those woods that fit the description, but the House and Barn proper are the biggest we saw, are right off the trail and are replete with graffiti. The woods and fields of Westford continue to delight and surprise me — each natural feature or new (to me) wooded area gives me an infinite set of photo and exploration opportunities. Of course most of New England’s fields and therefore her vistas are over grown with young trees today so to the casual observer everything looks like a small woods. A photographer who helped with the Conservation Trust’s calendar project questioned me when I asked for landscapes taken in Westford. Not too many opportunities for that in Westford, he opined. Well, I think there is more than meets the eye. There are also just plain natural photo opportunities — not landscapes perhaps but woodland scenes that if captured bring home some of the natural beauty that we are surrounded by everywhere in Westford. There was a make shift ladder up against one of the boulders — I thought about trying it but I think the view might be just more trees. Then again it might just be worth the risk. After all the Boulder is only as big as a house! If you want to see it in person, go to Madison! It is amazing to think of how those massive stones were moved around by glaciers, and that this whole area was once under hundreds of feet of ice, and how much our landscape was shaped by that event. Maybe many people are still not “sold” on the dangers of the impending global warming because they harbor ancient fears of the return of an ice age. Hi Bill, Thank you for putting a proper name to these boulders. I wonder where the glaciers found these rocks. In the mountains perhaps? I look at boulders and usually think that they might have come from the ground nearby. When I walk along the power line access from Depot Street to Shipley Swamp I see lots of large granite boulders, much smaller than the House and Barn, and I wonder if they were dug up when the trolley line was put in or maybe from house construction or maybe by a passing glacier. In the case of the H&B there is no doubt that massive forces beyond the control or comprehension of mankind moved them. As to Global warming — some scientists believe the trend may be forestalling a new ice age. I read a report re: Yellowstone that mentioned that 10,000 years ago it was all under lots of ice, but 5000 years ago it was warmer than now. Lately it has warmed up again. We really don’t know what is causing this. I don’t believe that cause and effect is proven re: global warming and green house gases. Yet it is for sure that we need to cut down the amount we pump into the atmosphere. In order to avoid having things get worse quickly the human race is going to need to mature rapidly. Some fascinating stuff! I am an ‘old’ cave explorer now cataloging sites of geologic interest across Massachusetts and Rhode Island. 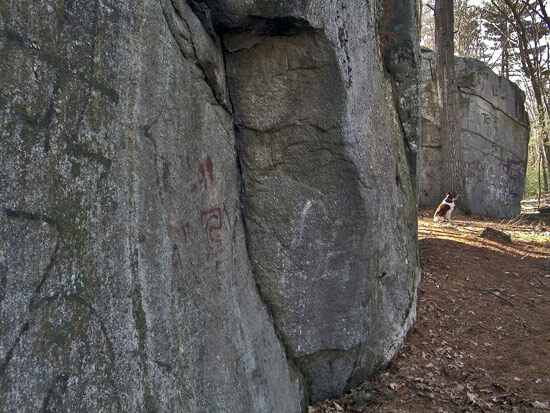 I’ll stop out your way this Spring and measure your boulders for inclusion onto my list of the State’s largest. I grew up at the end of Sawmill Rd, and those rocks still occupy a very fond place in my heart. Not far past the house and barn the trail forks – the left wanders through the forest for a couple of miles and if I remember correctly emerges near Long Sought For Pond. The right slithers through the forest in the opposite direction and ends at an old sand quarry a couple of miles away. There was an old granite quarry at the end of another trail in that beautiful neighborhood where we (the neighborhood kids) also found adventure and wonder. I’ve lived many places after moving away from Westford n 1984, but as far as I’m concerned that place will always be my home. Thank you for bringing this wonderful part of my life, slightly fuzzier from years gone by, back into clear and vivid focus. I also grew up on Sawmill Rd and now live in LA. Not sure how I stumbled across this blog (because as a rule I have little time for blogging) but the house and the barn also hold a special place in my heart. I couldn’t help but comment. The stories of adventures I had in those woods are endless. I know that area like the back of my hand am looking forward to returning with my son one day. There are some other interesting finds out there including a stone oven almost 5 feet tall in the middle of nowhere in the swamp between the house and the barn trail and the former sand pits / quarry areas. Glad the rocks are still appreciated. Bill, I grew up spending summers (say 1970-1983) living in the Wymans Beach Campground, we would do weekends from Late April til the end of school setting up, and move in the day after school ended and move back the last weekend before school started. All of us kids in the campground knew the trail we called Blackfoot up to the House and Barn. We would go up there a few times each summer. You sort of graduated in steps from being a big enough kid to climb the House, and a bigger kid when you mastered climbing the Barn. Rites of passage if you will. Now my kids are grown, and Wymans is nothing but a memory, but seeing this blog post was very cool. Knowing you can access this still makes me think I can hike up there with my children next time we travel up from Maryland.